Cables come off their position and might also break. In either case, you need the help of a qualified technician, who will be able to handle the situation in a professional and safe way. Call our company. If you are in need of garage door cables repair in Oakville, ON, we are the number one option. We have a committed team here that will go out of its way in order to see that your service needs are covered at once. The technician will fix any problem with the cable and come prepared to replace snapped cables too. Get in touch with Oakville Garage Door Repair for affordable services and exceptional customer care. Whether garage door cables work with extension or torsion springs, they are still tensed. Sometimes, springs & cables snap together. Sometimes, cables just come off when the tracks are not aligned or the drums are damaged. When you are dealing with problems, what you want is an experienced tech that will have the skills to identify the problem and fix it right. Contact us. Not only will a pro provide the required garage door cables repair but also arrive promptly to tackle the problem. With great experience in repairs, the pros know how to handle the most complex situation and in a safe manner. That’s important because it ensures the repair is done correctly and the overhead door performs safely. The cables keep coming off? One of the cables is off the track? No matter what the cable issue is, get in touch with our team and we’ll set a repair service up right away. Is one of the cables broken? 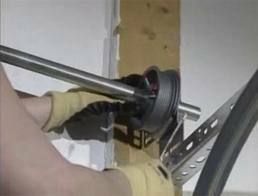 We can arrange garage door cables replacement in Oakville, Ontario, at once. Call us now if your cable snapped. A tech will come to replace it as soon as possible. With years in this job and thus experience in installing garage door cables, the techs ensure the job is completed by the book and your door is safe. It will be our pleasure to help you with your cable problems. If you ever need garage door cables repair Oakville services, reach out to us and we’ll help right away.